Do you send text alerts to international phone numbers? Yes, we support international phone numbers from over 198 countries. Please enter country code prefix and phone number to receive text alerts on your international phone number. Please enter all phone numbers with no leading “0”s, no international trunk code, just a “+” followed by the country code, followed by the rest of the number. Reference to Wikipedia page with list of countries and their calling code. What is my username for login? Your username is created from the email address you used during registration e.g. The welcome email you received after registration also contains your username. You can login with your username or email address. Can I swing trade the stock alerts or do I have to exit at market close? Our algorithm selects stocks that have highest potential of moving in the trade direction. These stock alerts come with specific entry, exit and stop levels. But, depending on how the stock is performing on the intra-day (1, 5, 15 and 30 minutes) and daily charts, you can decide to hold it overnight or swing trade it for a couple of days. What sets you apart from other stock picking services? eStockPicks is here to make you successful in the stock market. We strive to keep things simple and transparent. We publish every stock pick on our Stocks and Dashboard page. We don’t hide anything. You can verify our performance yourself. We strongly encourage you to do it before joining us. We don’t claim our members have made $4000 in a day or had 35% gain in an hour. Instead we provide the tools to help you reach your maximum potential. We are not a chat room service where they say one thing and do something else. Our main focus is on generating high probability unbiased stock alerts for you to trade on your own pace. Can I change (upgrade/downgrade) my subscription? Absolutely! You can switch subscription in My Account. You can upgrade or downgrade your subscription level anytime. Payment will be prorated for Advanced and Premium subscription as of the switching date. Lite subscription is Free. I’m a returning customer. How do I sign-up for new subscription? Log into My Account with your email address and password. If you have forgotten your password, reset it through the Lost Password link. Once in My Account, you can sign-up for new subscription. Your previous subscription and order history is available in My Account as well. Are stock pick alerts available through social media channels? Yes, stock pick alerts are posted on social media. Please follow us on these platforms to join the conversation, share knowledge, and get the best stock pick alerts for trading. Are stock charts available? How do I open stock charts? Click on the stock symbol on the Stocks or Dashboard (subscribers only) page to open charts for analysis. Chart links are also included in the Text Message and Email stock pick alerts. What is a trading plan? How do I create a trading plan? Do you have sample trading plan? A trading plan is your rule book that outlines what, when, why, where of trading. You create your rules with detailed trading activities and follow it every single day. You must have a trading plan for successful trading. Following should be part of your trading plan – customize it to your needs. Read your plan before trading each day. Daily trading strategy: Buying qualified support and selling qualified resistance after strong buying/selling signals are presented by the market. No overnight positions. Time window strategy: Two trade per hour on average with the goals of trading for 3 hours per day and hitting or exceeding the daily dollar goal. To Download Trading Plan Template Click Here. Buying or selling stocks and holding it in your account for a few days or weeks is swing trading. Investing in a stock with short time horizon to catch price movement over some news, earnings or market conditions is swing trading. More information on swing trading click here. In simplest terms, buying and selling a stock the same day is called day trading. The goal is buy or sell a fast moving stock at a certain price and then sell or buy within a few minutes or hours in the same day. Day traders focus on both long and short trades. Traders repeat this process several times in a day on the same stock or different stocks. At the end of the day they close all their positions and start over again the next day. More information on day trading click here. What does type “Short” mean in the stock pick alert? This is opposite of Long trade. You are first selling the stock because you believe it will go lower. Then you buy it back at a lower price to close the trade. Margin account is required at your brokerage for Short trading. When the market is trending lower, there are more Short trading opportunities. 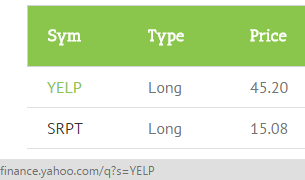 What does type “Long” mean in the stock pick alert? When the market is trending higher, there are more Long trading opportunities. We are in a Bull market, the stock picks look good. But, what happens during Bear market? eStockPicks’ real time stock pick alerts system is built to work in all market conditions – Bull, Bear and Flat. The system generates both Long (buy) and Short (sell) stock pick alerts for trading. So, in the Bear market you might see more Short trading opportunities than Long and vice-verse during Bull market. The heuristic algorithm takes into consideration several factors before picking the wining stock for trading. What is the range in Entry and Exit columns in the stock pick alert table? Real time stock pick alerts are distributed to subscribers at a certain stock price. The Entry column displays the suggested price range to buy (Long) or sell (Short) the stock. It’s generally recommended that the stock should be avoided if the price has moved out of the range as the market conditions change every minute. The Exit column displays suggested price range to close the trade. If the stock picking system is so good, why sell the secrets via subscription? Ah, this question surfaces right away when you see subscription services for stock trading system. We know that feeling – been there before ourselves. That’s why we build this robust platform with minimum bells and whistles and focusing just on what’s important for successful trading. We’ve used this for several years and it’s proven to work. There is enough money to be made in the market, so us providing the subscription services does not impact our ability to continue to use it ourselves. You can combine your trading strategy with our stock pick alerts and create your own unique trades. Traditionally big brokerage and banks have had this type of services exclusively available to them. We are bringing it to everybody; retail investors and traders, trading clubs, investment groups and more. Click on My Account to open login page. Then click on “Lost your password?” link and enter your email address used during subscription. Instruction will be sent in the email to reset your password. How do I change my password, email, phone, etc.? In My Account you can update existing account information such as your name, password, phone number and email address. Use the Edit Account tab in the lower left side to update your password. Use the Change Address tab to update your name, email and phone. My Account page manages your subscription, orders and account information. It displays your orders and current subscription. You can put Alerts On-Hold while on vacation or if just don’t want to be disturbed for a few days. Address, username, login and password can be updated in My Account. What is Dashboard (subscribers only) page? Dashboard page displays real-time alerts for Advanced and Premium subscribers and with some delay for Lite subscribers. It also shows history of alerts for the last 10 days. It’s instantly activated once the checkout process is completed. You can click on the stock symbol in the table to open charts for further analysis. What happens when I cancel subscription? You can cancel your subscription anytime in My Account on eStocPicks website or at PayPal. Once the subscription is cancelled, you will not be charged again. You will continue to receive Text and/or Email alerts and have access to dashboard until your current subscription expires. If you would like to continue, just log-in and renew the current subscription or select another subscription level. We have over 20 years of experience in trading stocks, bonds, futures, commodities and forex. We trade the same markets as you everyday with our alert system. With advanced trading platforms, eStockPicks provides solutions to individual traders to learn and trade on their own. Trading is not only for big banks and hedge funds anymore. We’ve designed eStockPicks system for retail traders passionate about the markets and trading. We built the trading system with years of market research and analysis – fundamental and technical – to help everyone trade with an edge. Our goal is to make you consistently profitable. Give us a try. We are here to support your trading ambitions. Contact us anytime – we would like to hear your story and successes. eStockpicks, respects each individual’s right to privacy. We value our relationship with you, and we take pride in maintaining loyalty and respect with each individual client by providing you with security. The provisions of this notice apply to former customers as well as our current customers. When you purchase or subscribe to a eStockpicks product, we collect personal information about you for business purposes, such as processing your requests and transactions, informing you about products and services that may be of interest to you, and providing customer service. The personal information we collect is only accessible to eStockpicks and its affiliates and is not disclosed to any non-affiliated third parties. We work hard to ensure that our websites are secure and that they meet industry standards. We use SSL (https) protocol to encrypt all data transfer. We also use other safeguards such as firewalls, authentication systems (e.g., passwords and personal identification numbers) and access control mechanisms to control unauthorized access to systems and data. This site contains links to other sites. eStockpicks is not responsible for the privacy practices or the content of such Web sites. Periodically you might receive marketing and sales emails. You can unsubscribe at anytime to stop receiving such type of messages. If you have any questions about this privacy statement, the practices of this site, or your dealings with this Web Site, you can Contact Us. We reserves the right to modify this policy at any time.